CORYDON , Indiana (and the general area) – After spending the night in the beautiful Leavenworth Bed & Breakfast Inn I headed for Corydon. I learned as I was departing of a new winery on Ind. 62 near Corydon I had not heard of previously. Click here for photos from the second of my two days in Southern Indiana. Scout Mountain Winery is about six miles west of the old state Capital. Michael and Margaret Schad own a bed and breakfast and an orchard. They opened their winery this spring with a modest 900 gallons of wine but are experiencing success. Mike, a former toolmaker, shared his story while pouring wine. They’ve already sold out of their Traminette and Vidal Blanc. Mike noted he has gotten lots of help from Dan Adams at Winzerwald, Jim Pfeiffer at Turtle Run, and Ted Huber at Huber winery. The Scout Mountain wines were unique in two ways. 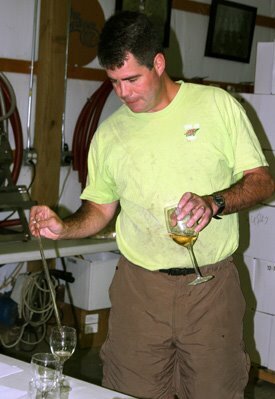 Some of the traditional Indiana grape wines – Chardonel, Chamourcin – were done in a light style that was well balanced. They were very good wines for a first-year effort. But Mike has some of that ‘mad scientist’ in him that runs through many of these winemakers near the Ohio River. He wanted me to try his Apple-Strawberry wine. I was surprised to find the fruit wine a nice combination. It was not too sweet and had the tartness of apple with a lingering strawberry flavor on the finish. He’s planning another blend called Blue River Blush which will combine Chambourcin, Riesling, and Apricot. It sounds like a crazy mixture, but he pulled it off with the first one. I asked how he came up with the Scout Mountain name and he shared asking residents about the area’s history. It seems there was a Boy Scout camp over the hill near the river which closed in the 1920s. So he thought Scout was a perfect name for the winery … and doesn’t mountain just sound better? For me, the wine highlight of the day was a visit to Turtle Run Winery west of Corydon. I had heard alot about owner/winemaker Jim Pfeiffer and he didn’t disappoint. He was working on a white wine blend while I was there and it was alternately fascinating, educational, entertaining, and at times maybe even a bit silly. He allowed me and a family of three to smell and taste the various blends. “Everybody does it this way,” he repeated over and over. He has a bit of a frantic energy that’s just contagious. When you talk about “passion” for wine, Pfeiffer’s mug could be beside the definition. He makes a lot of wine. There were 20 wines on the tasting list. He hopes to more than double his production the next few years and get the winery to 10,000 cases. He’s making some wines others are not and may be one of Indiana’s most creative when it comes to blending wines. “We’re blend-a-holics,” he laughed. The last wine I tasted was one of the most interesting of the two-day trip. Jim’s Summer Solstice is a blend of Chardonnay, Gwertztraminer, Traminnette and Chardonel. And by Jim’s definition, he just oaks the Chardonnay until he kills it. Oddly, but in a good way, the oak is the first thing to hit your palate then layers of fruit carry on through the finish. I liked his nice Catawba and wonderful Vignoles. His Syrah was as good as many $15 bottles you’ll find in any wine shop. He also does Zinfandel without oak – almost unheard of to most wine drinkers. I tried the Zin and liked the flavor, but missed the oak. I really liked his Red My Mind Barrel Aged bottle of Merlot and Chambourcin. I read the notes which said the wine wouldn’t taste like either grape and it was right on. The wine actually reminded me of a Pinot Noir style wine. I bought a couple $14 bottles. There are several more on his list that I enjoyed. But it’s all blurred by his work blending his Dry Tortuga which is one of his best sellers. It’s a blend of 2005 barrel-aged vignoles, 07 late harvest vignoles, 07 stainless steel aged chardonel. Now that was the blend on the bottling he had just sold out. But it gives you the idea. Who said “Mad Scientist?” Well, I did. Jim, discussing the Solstice, prefers to think of himself more as Picasso. Turtle Run is not terribly far from Huber’s which I have written about here on several occasions. 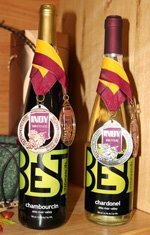 I’d strongly recommend both for some of the best wine made in Indiana. About six miles away, I couldn’t tell anyone exactly because I got lost, is Best Vineyards. Best is in its second year of operation with a 10-wine lineup. The big seller is a very light Peach/Chardonel combination they consider a dessert wine. I was surprised it wasn’t a sugar bomb considering the sugar they add. It was pleasant and nicely balance for so much sweetness. 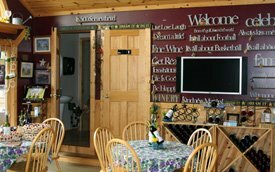 Their Lavina is your typical Concord Grape wine with an exception – the Concord grapes came from Canada for this one. It was a lighter, softer style Concord. I liked their Hummingbird Red ($11.95) which is a light style red made from Chambourcin. I could see sipping this one without food, sitting on the porch. My last stop of the day was at Indian Creek Winery with their 12-wine offering. Indian Creek is on the west side of Georgetown, Indiana, just north of I-64. 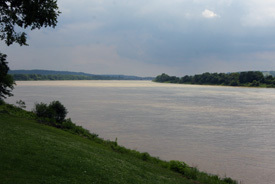 These last three wineries are all relatively close together and close to Huber – just west of Louisville on the Indiana side of the river. Indian Creek does a Dornfelder, the grape Germany considers its Pinot Noir. They have a couple of blends and a lineup of sweet wines. I don’t know if it was a quick lunch I grabbed before getting to Indian Creek, if it was the end of a long day and tasting wine at three previous stops, but I found a taste to all their wines that I just couldn’t shake. It wasn’t helped when the young man, the owner’s son, noted one bottle I was tasting had been open a week. There was an odd odor to each glass that carried through to the taste. We even switched glasses after the first couple. Maybe it was me, I’m giving Indian Creek the benefit of the doubt after just one visit. I started the morning in Madison, Indiana – a place Charles Kuralt, of CBS News fame, once called the prettiest river town in America! I bought fresh peaches on the hill and visited the farmers’ market on a beautiful, old side street downtown. Then it was down the river to Vevay, Indiana, – home of the late-August Swiss Wine Fest that draws a dozen or more Indiana wineries each year. 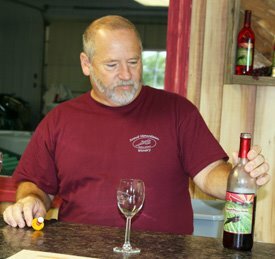 Ridge Winery sits about five miles east of Vevay on State Highway 56. The tasting room appears to be built off the end of a beautiful new home. 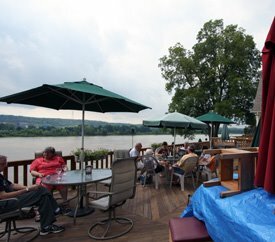 There’s a large deck with plenty of tables on the back side of the house where you can sip wine right along side the Ohio River. The tasting room is full of wine-related gifts and novelties and two delightful women pouring a sip for the many visitors. They had 12 wines on their tasting list and I had small samples of several. Their sweeter wines were typical of most Indiana wineries, but a tad more sweet than most I had tasted during this trip. Their “Country Red” made from Stueben grapes had a pleasant and light nose and taste. It’s the kind of sweet red many Hoosiers enjoy. Their attempts at a Cab/Merlot blend and a Cabernet – well – let’s just say there is an incredible view of the Ohio River on the deck at Ridge Winery! Another nice note about this winery is its less than five minutes from the Belterra Casino and Resort. And across the river from the Casino is the Kentucky Motor Speedway.